Please refer to our stock # SF-116 when inquiring. 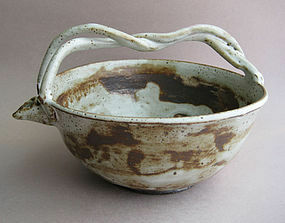 Braid-handled Bowl with Pouring Spout, suitable for Sake, Flowers, Food; by Sachiko Furuya; Honolulu, HI. White Shino and Bamboo Ash glaze. H. (Bowl only) 3.5"(9cm) [H. w/ Handle 5.5" (14cm)] x Dia. 7.5"(19cm) [Width with Spout 9" (23cm.)] Sachiko Furuya hails from Yamanashi Prefecture, Japan. There, she studied pottery with Yukio Matsuura, making primarily tea wares for practitioners of the Omotesenke School of Tea. She also attended the College of Arts at Nihon University (Tokyo,) Suidobara Fine Arts Academy (Tokyo,) and has a Studio Art degree from Clark College in Dubuque, Iowa. She has exhibited her work in galleries and museums in the United States and Japan. She also owned and operated her own gallery in Edmonds, WA from 1997-2000. Currently, she resides in Hawaii, where she finds new inspirations to complement her aesthetic sensibilities cultivated by her time in Japan and the Pacific Northwest. Sachiko's pottery glazes often make use of bamboo ash (J. take bai) and a high iron content. Her forms tend to be raw and organic, illustrating her preference to let the materials speak for themselves.